The Kermadec Trench runs northeast from the North Island of New Zealand (shown in red in this illustration) to the Louisville Seamount Chain. It is the second deepest oceanic trench in the world and formed by subduction, a geophysical process in which the Pacific tectonic plate is pushed beneath the Indo-Australian Plate. Image courtesy of Jack Cook, Woods Hole Oceanographic Institution. Download image (jpg, 34 KB). The deepest parts of the ocean, from 6,000 to 11,000 meters depth, comprise an area known as the “hadal zone.” This zone is a series of trenches, troughs, and deep depressions found around the world. Although the hadal zone accounts for the deepest 45 percent of the global ocean, it remains one of the most poorly investigated habitats on Earth. Far from being devoid of life as originally perceived in the 1800s, more than 400 species are now known to live in the 21 trenches of the hadal zone. 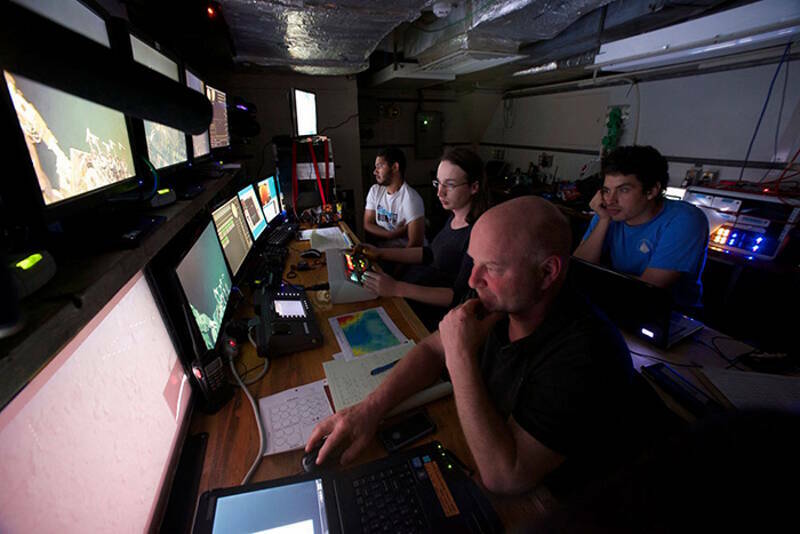 From April 12 – May 20, scientists will be on board the R/V Thompson, using the hybrid remotely operated vehicle, Nereus , to explore systematically for the fist time, the hadal Kermadec trench system and the neighboring abyssal plain in the Southwestern Pacific, north of New Zealand. This expedition is the first of many anticipated missions that will be conducted as part of the Hadal Ecosystems Studies (HADES) Program. HADES is a collaborative program involving researchers from nine institutions. 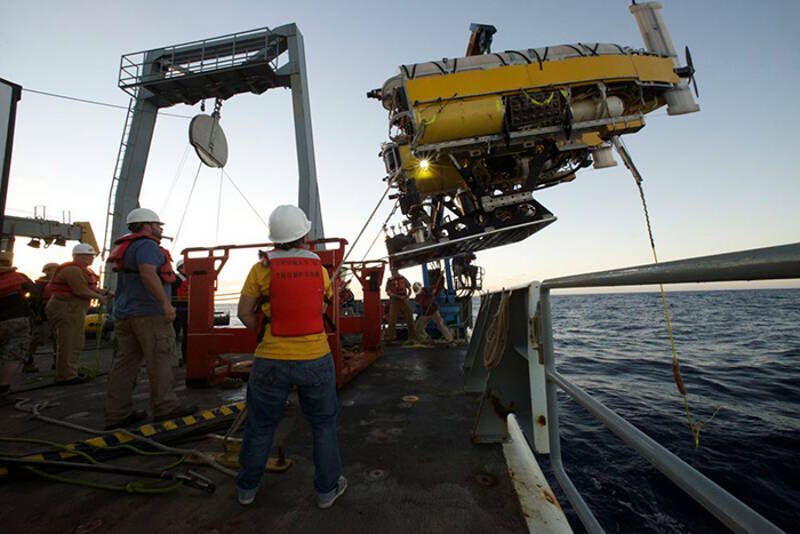 Funded by the National Science Foundation, HADES is at aimed answering the foremost questions in trench and hadal ecosystem science, to determine the composition and distribution of hadal species and the that role pressure, food supply, physiology, depth, and seafloor topography have on deep-ocean communities and the evolution of trench life. We’ll be posting short updates throughout the expedition, but be sure to check the HADES program website for full expedition coverage, including posts, images, and video. The action as the science party and Nereus team make final preparations for the mission before leaving Auckland on April 11, 2014. 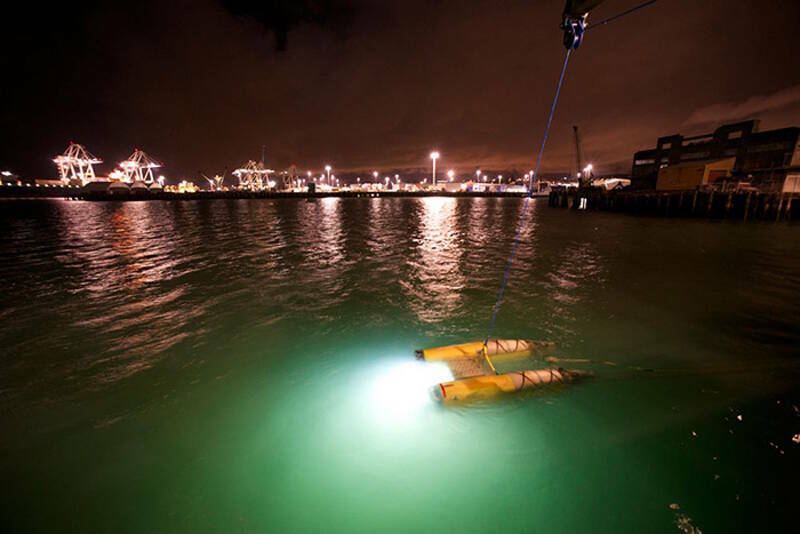 A dip test of Nereus in Auckland Harbor enabled the team to perform an initial check of vehicle systems the night before leaving port. Image courtesy of Ken Kostel, Woods Hole Oceanographic Institution. Download image (jpg, 43 KB). A team prepares a weight to go over the stern of R/V Thomas G. Thompson to test repairs to the winch. There is a saying in oceanography, “Don’t put anything in the water you can’t afford to lose.” Image courtesy of Ken Kostel, Woods Hole Oceanographic Institution. Download image (jpg, 75 KB). There is a saying in oceanography, “Don’t put anything in the water you can’t afford to lose.” The day someone first decided to study the ocean was the day he or she first lost an instrument in it. The day after—once that poor soul had fixed what went wrong the first time—was the day ocean science truly began. To understand and accept that risk, to have the ship, the equipment, and the people all in place and ready and yet to be denied the opportunity to try is harsh. But it’s not uncommon, because a last-minute addition to every ship’s manifest is Murphy, and his law can trump the command of even the best captain. Three nights ago, Nereus and the vehicle’s depressor went over the side without a hitch, and the extra deckhands and late watch-standers drifted off to get some sleep. Moments later, with the vehicle at less than 200 meters beneath the surface, an alarm sounded on the winch control in Mission Control. A quick radio call to the spotter on deck told us that the level arm, which keeps the cable properly aligned with the winch drum, was not moving. The Nereus team stopped the winch, but the vehicle and depressor continued down under the pull of the vehicle’s descent weights. When both reached the limit of the cable that had already been paid out, they began to jerk and bounce in the water as we rose and fell on the waves. After a few minutes, Nereus’ float pack separated from the main body of the depressor, as it is designed to do, and Nereus continued down. Somewhere along the way, the optical fiber in the float pack separated. When Nereus sensed that its link to Mission Control had been severed, it began a countdown to release the descent weights and return to the surface. The delay is programmed in so that we can move the ship to a safe distance. One hour later, we caught sight of the vehicle’s strobe light across a moonlit ocean and began the recovery process. Nereus always looks impressive coming out of the water. It exudes a sense of refined purpose. But that night it had been robbed of its purpose and it settled into its cradle like a racehorse taken for a leisurely trot halfway around the track and then stabled. Later in the night, the wind picked up and for the next two days we were idled while a storm spun far to the west of us. The key is to limit the damage Murphy can do by anticipating his every move and keep him confined as much as possible. That’s why we check and double-check lines and fittings. We run through pre- and post-dive checklists. We constantly look around us and above us. But some things escape even the most watchful eye, and no one would leave the dock if they had an infinite to-do list and unlimited time. At some point you have to trust that as much has been checked off that can be and lift your lines. You take the leap of faith, you think Murphy’s safely behind you, then you turn a corner, and there he is. The good thing about being on many expeditions like this is that it is invariably staffed with people who can disassemble, reassemble, fashion, modify, or improve just about anything. It’s a necessity out here, where a round-trip to the hardware store is measured in days or weeks. The autonomous underwater vehicle Sentry once flooded while deployed and caught fire, destroying most of its internal electronics. Engineers took it apart, cleaned up what they could and used spare parts on board to rebuild it. At sea. In four days. So Murphy made an appearance and enacted his law on this trip. Fine. Now he can watch while we put things right and get back in the water. Eat or Be Eaten. The hadal lander deployed by Alan Jamieson and Thomas Linley from the University of Aberdeen provides a rare glimpse at a few of the animals that live in total darkness on the deep seafloor. Their bait attracts scavengers—here mostly basketwork and snubnose eels—as well as any other deep-sea creatures that happen by while the cameras are on. Image courtesy of Alan Jamieson, © University of Aberdeen. Download image (jpg, 34 KB). 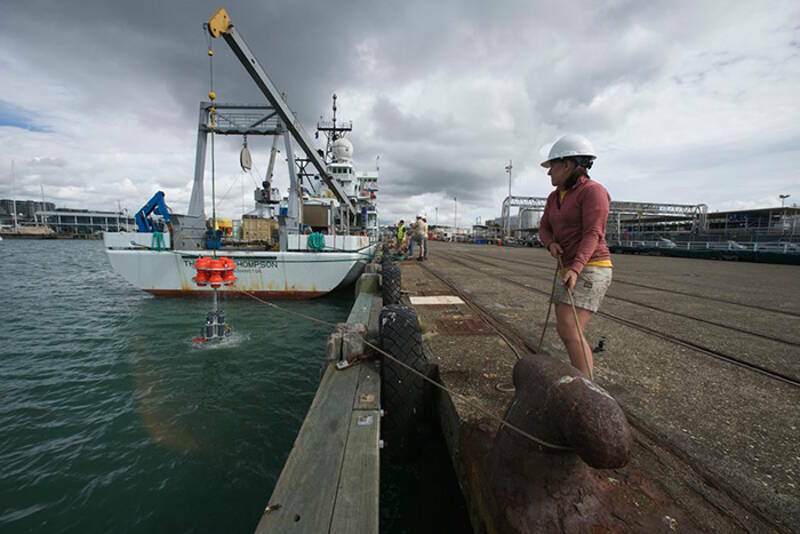 Ordinary seaman Michelle Barutha helps deploy a hadal elevator from the deck of R/V Thomas G. Thompson during ballast tests on the dock in Auckland Harbor. 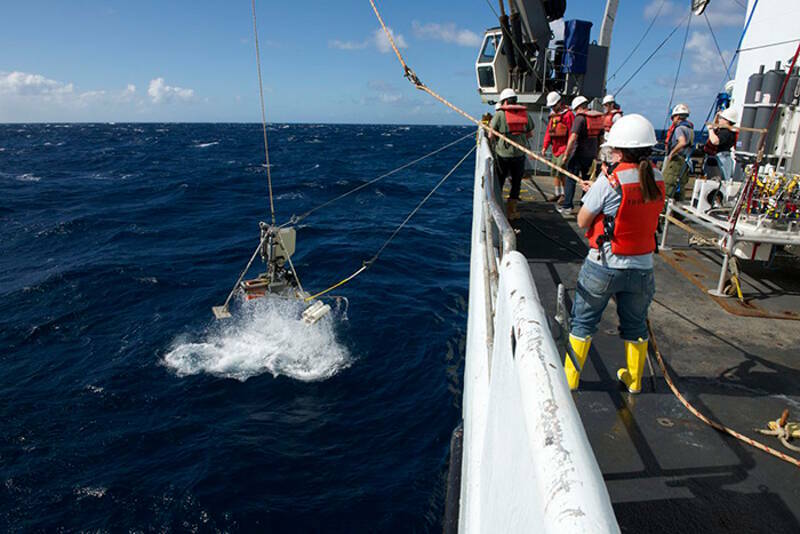 The elevator will be used to return an experiment to the surface that aims to quantify the metabolic rate of deep-ocean animals and how this changes with depth in the Kermadec Trench.Image courtesy of Ken Kostel, Woods Hole Oceanographic Institution. Download image (jpg, 58 KB). The hadal lander returns from a deployment to 5,000 meters last week. Image courtesy of Ken Kostel, Woods Hole Oceanographic Institution. Download image (jpg, 69 KB). Despite some technical setbacks, the HADES team has so far successfully deployed Nereus to 4,000 meters and the fish trap, hadal lander, and abyssal lander eight times to depths ranging from 4,000 meters to 5,100 meters. The expedition is currently in Auckland awaiting repairs to the crane that deploys and recovers Nereus. Initial observations from the lander images by Alan Jamieson and Thomas Linley from the University of Aberdeen have shown the expected transition in fish community composition from one dominated by rattails at 4,000 meters to the beginnings of the deeper, cusk eel-dominated communities further down. 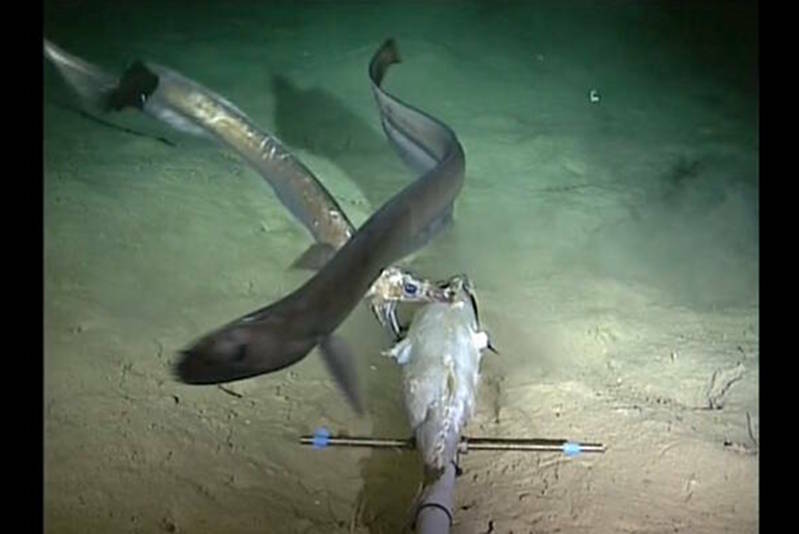 The hadal lander also captured video footage of cusk eels feeding on amphipods near the bait, the first recorded observations of their feeding behavior. Individual fish brought to the surface in the trap deployed by Jeff Drazen, Clif Nunnally, and Mackenzie Gerringer of the University of Hawaii are being recorded, dissected, and sampled for identification and analysis of age and growth rate, feeding behavior, and environmental adaptations. Amphipods are also being brought to the surface for analysis of their adaptations to increasing pressure, as well as their reproductive stages and strategies. Several individuals of fish and amphipods have been identified as possible new species, but confirmation of this will require more careful taxonomic analysis than possible on board the Thomas G. Thompson. Data from a respiration experiment deployed with Nereus to 4,000 meters and transferred to the hadal elevator has begun to reveal differences in the metabolic rates of some common benthic organisms found at abyssal (4,000 to 6,000 meters) and hadal (more than 6,000 meters) depths. Oxygen consumption by brittle star, two sea cucumbers and two anemonesover 24 hours has shown that, without accounting for non-water body mass, the brittle star has the more active metabolism, likely because it is the more mobile of the group, but that the anemones may slightly outpace the sea cucumbers. 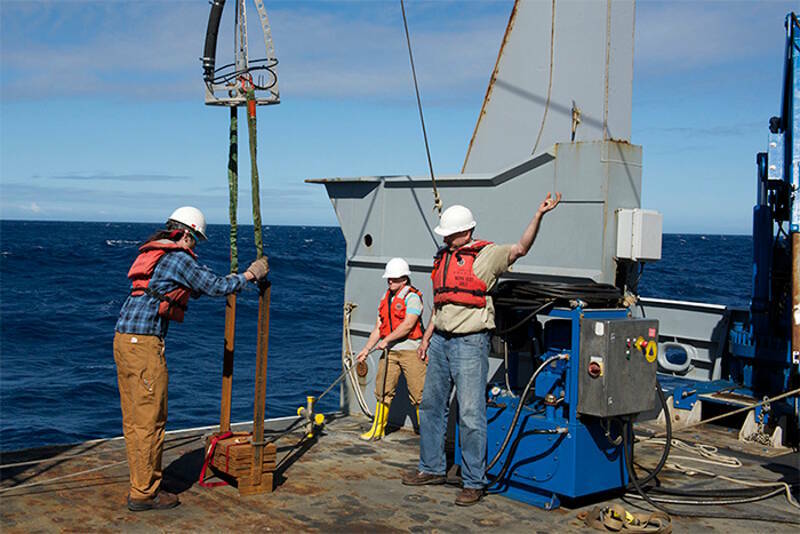 Further respirometry data from more individuals combined with data for species abundance and particulate carbon will help refine estimates of carbon uptake and sequestration in ocean trenches. Even these preliminary results speak to the general lack of even basic knowledge about the deep ocean and hadal ecosystem. That's why the scientists, engineers, and crew of the Thomas G. Thompson are anxious and eager to return to the waters over the Kermadec Trench. 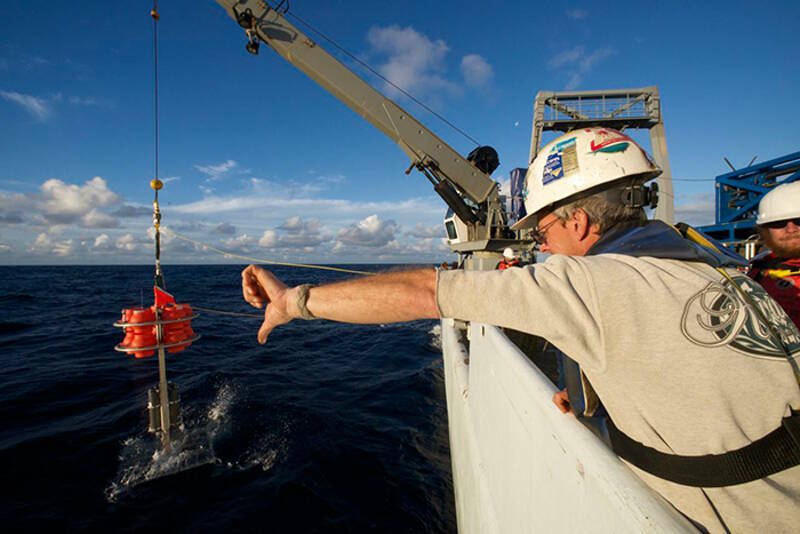 Once repairs to the crane are complete and a new Nereus tether is on board, the NSF-funded expedition will do exactly that, and continue their work exploring along the trench and nearby slope to the abyssal plain. Eleanna Grammatopoulou from the University of Aberdeen collects a water sample from Niskin bottles mounted on one of the landers to compare particulate organic carbon in the bottom and surface waters. Image courtesy of Ken Kostel, Woods Hole Oceanographic Institution. Download image (jpg, 67 KB). Members of the Nereus team and ship's crew recover Nereus to the deck of Thomas G. Thompson last week. Image courtesy of Ken Kostel, Woods Hole Oceanographic Institution. Download image (jpg, 61 KB). Mario Fernandez, Casey Machado, Tim Shank, and Santiago Herrera (left to right) in the Nereus control room during an 8-hour dive to 6,000 meters. Image courtesy of Ken Kostel, Woods Hole Oceanographic Institution. Download image (jpg, 54 KB). This week, Nereus made dives of increasing depth along the axis of the Kermadec Trench and has so far spent roughly 24 hours on the seafloor. At 6,000 meters, the vehicle collected push cores for sediment, microfauna, and macrofauna analysis and ran imaging transects; at 7,000 meters, the team deployed the respirometer, collected macrofauna samples and push cores, and conducted imaging transects. The terrain of the seafloor seen so far has been varied, ranging from sediment ponds to steep cliffs, from fine-grained sediment to loose gravel to boulders, and from carbonate chalk to basalt to highly altered rock. The diversity of seafloor structure underscores the wide range in community structure as well as the abundance and diversity of the organisms that have been documented just between 6,000 and 7,000 meters on Nereus transects and deployments of the hadal and abyssal lander and fish trap. Specimens of roughly two dozen species have been collected so far and more than twice that recorded on transects and lander images. A few highlights of animals brought back to the surface include seven different species of fish overall, including nine snailfish; nearly one dozen amphipod morphs plus a super-giant amphipod; three different shrimp species; and a variety of isopods, gastropods, crinoids, and other organisms. A half-dozen water samples and two dozen push cores have been filtered or sampled for microbial genomic analysis and there are already roughly 20 high-pressure cultures prepared. 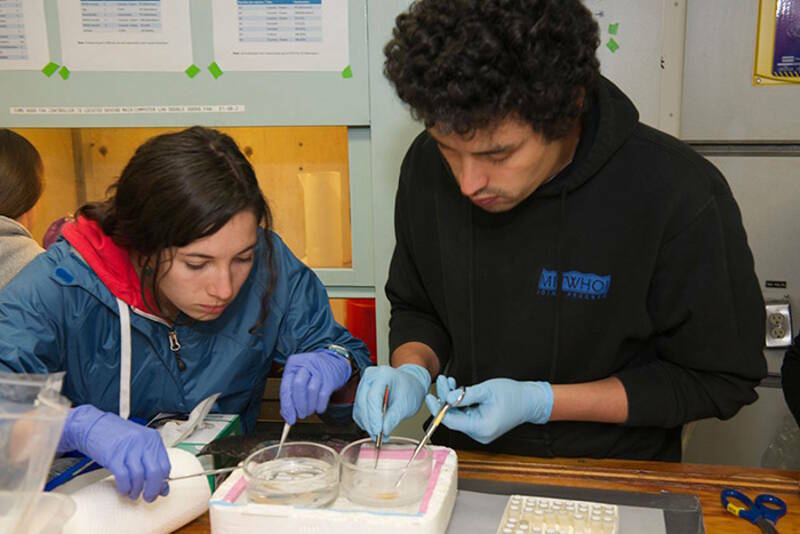 Whitman College undergraduate Gemma Wallace and WHOI post-doc Santiago Herrera collect samples of amphipods from 7,000 meters in the Kermadec Trench. Image courtesy of Ken Kostel, Woods Hole Oceanographic Institution. Download image (jpg, 53 KB). 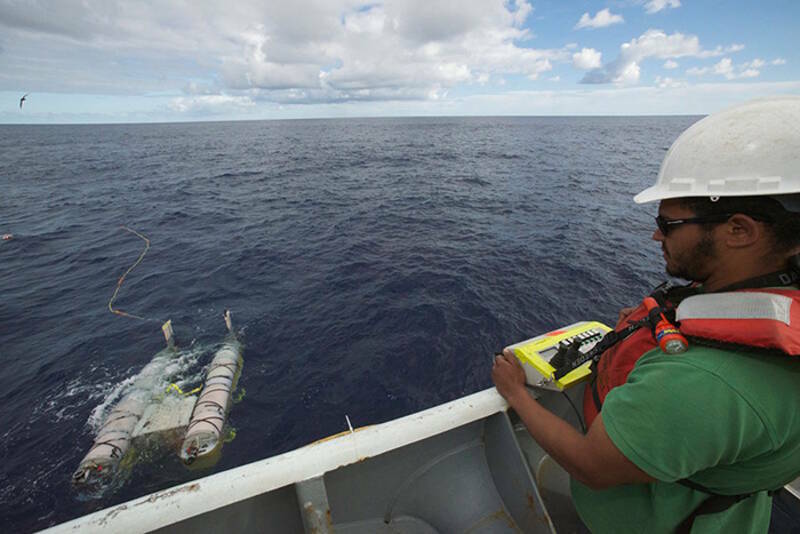 WHOI engineer Mario Fernandez remotely pilots Nererus on the surface close to the ship during recovery of the vehicle. Image courtesy of Ken Kostel, Woods Hole Oceanographic Institution. Download image (jpg, 56 KB). Farewell to Nereus. 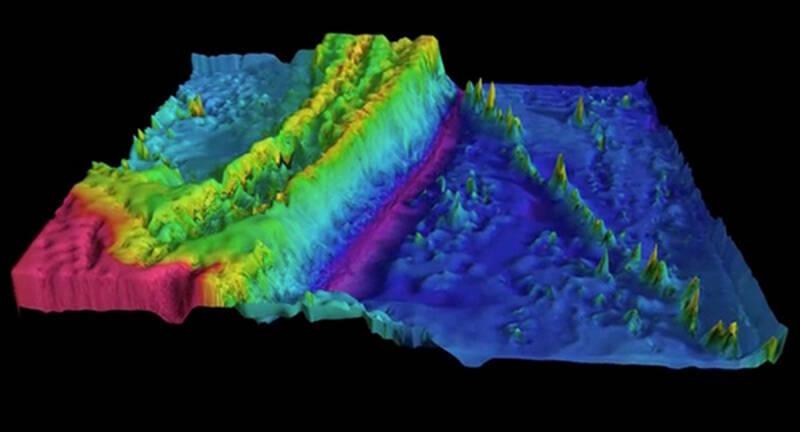 Scientists think Nereus imploded exploring the Kermadec Trench. Image courtesy of Advanced Imaging and Visualization Laboratory, Woods Hole Oceanographic Institution. Download image (jpg, 29 KB). On Saturday, May 10, 2014, at 1:00 a.m. local time (May 9, 9:00 a.m. EDT), the hybrid remotely operated vehicle Nereus was confirmed lost at 9,990 meters (6.2 miles) depth in the Kermadec Trench northeast of New Zealand. The unmanned vehicle was working as part of a mission to explore the ocean's hadal region from 6,000 to nearly 11,000 meters deep. Scientists say a portion of it likely imploded under pressure as great as 16,000 pounds per square inch. 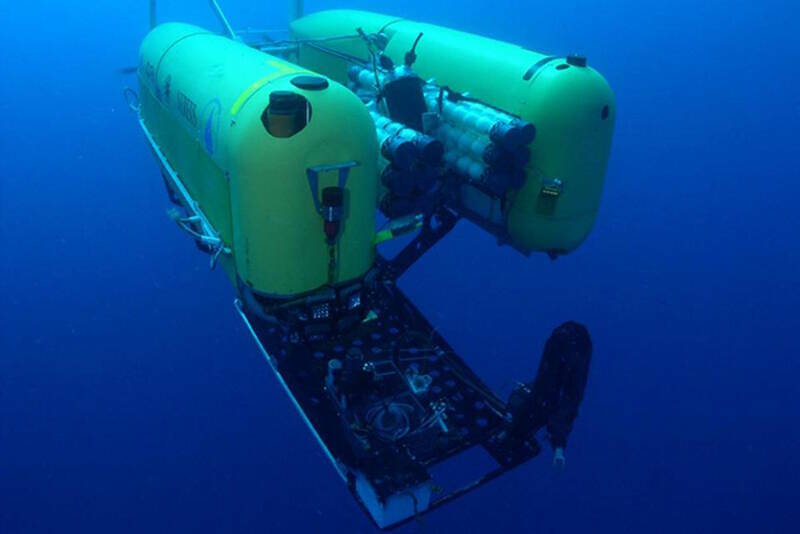 Nereus was built in 2008 by the Deep Submergence Lab at the Woods Hole Oceanographic Institution (WHOI) with primary funding from the U.S. National Science Foundation (NSF) to descend to the deepest parts of the ocean and to operate either autonomously or to be controlled remotely from the surface. 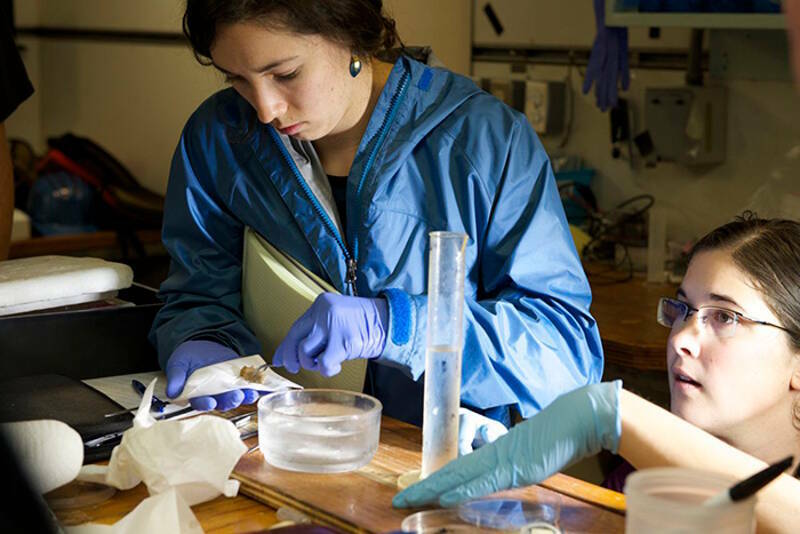 WHOI engineers incorporated a number of novel technologies into its design for use in remote operations, including an optical fiber tether for use in remote operations, ceramic flotation, and lithium-ion batteries. Its mission was to undertake high-risk, high-reward research in the deepest, high-pressure parts of Earth's ocean. At the time it was lost, it was 30 days into a 40-day expedition on board the research vessel Thomas G. Thompson to carry out the first-ever, systematic study of a deep-ocean trench as part of the NSF-sponsored Hadal Ecosystems Study (HADES) project under chief scientist Timothy Shank, a WHOI biologist who also helped conceive the vehicle. "Nereus helped us explore places we've never seen before and ask questions we never thought to ask," said Shank. "It was a one-of-a-kind vehicle that even during it?s brief life, brought us amazing insights into the unexplored deep ocean, addressing some of the most fundamental scientific problems of our time about life on Earth." Researchers on the Thompson lost contact with the vehicle seven hours into a planned nine-hour dive at the deepest extent of the trench. When standard emergency recovery protocols were unsuccessful, the team initiated a search near the dive site. The team onboard spotted pieces of debris floating on the sea surface that were later identified as coming from Nereus, indicating a catastrophic implosion of the vehicle. The ship's crew is recovering the debris to confirm its identity and in the hope that it may reveal more information about the nature of the failure. In addition to the Kermadec Trench, Nereus had successfully traveled to Challenger Deep in the Mariana Trench—the deepest point in the ocean—and explored the world's deepest known hydrothermal vents along the Cayman Rise in the Caribbean Sea. It had been scheduled to return to the Mariana Trench in November as part of the second HADES expedition. Already on the first HADES cruise, Nereus had brought back to the surface specimens of animals previously unknown to science and seafloor sediment destined to help reveal the physical, chemical, and biological processes that shape the deep-ocean ecosystems in ocean trenches, which are unlike almost any others on the planet. 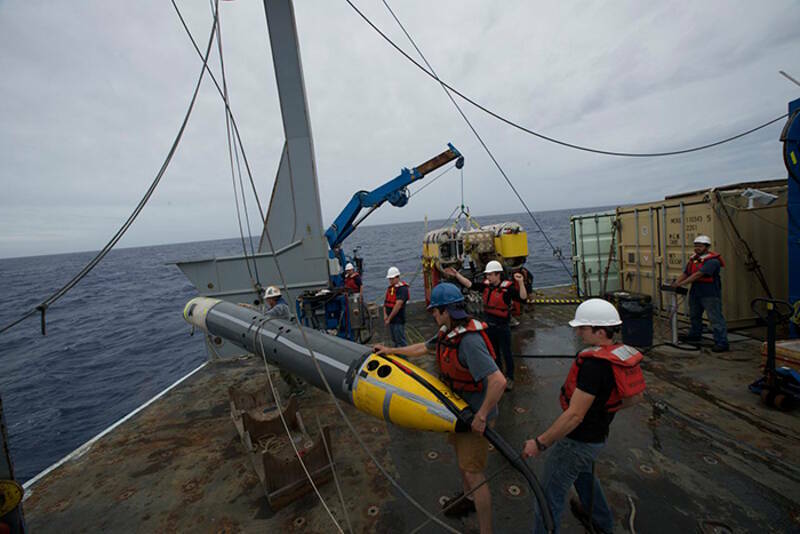 WHOI is a leader in the development of autonomous robotic vehicles for the exploration of the ocean, including the hybrid vehicle Nereus, which functioned as a remotely operated vehicle via an optical fiber tether and also as a free-swimming autonomous vehicle. It was one of only four submersibles in history to reach the deepest part of the ocean in the Marianas Trench. "Extreme exploration of this kind is never without risk, and the unfortunate loss of Nereus only underscores the difficulty of working at such immense depths and pressures," said WHOI Director of Research Larry Madin. "Fortunately there was no human injury as a consequence of this loss. WHOI scientists and engineers will continue to design, construct and operate even more advanced vehicles to explore and understand the most remote and extreme depths of our global ocean." 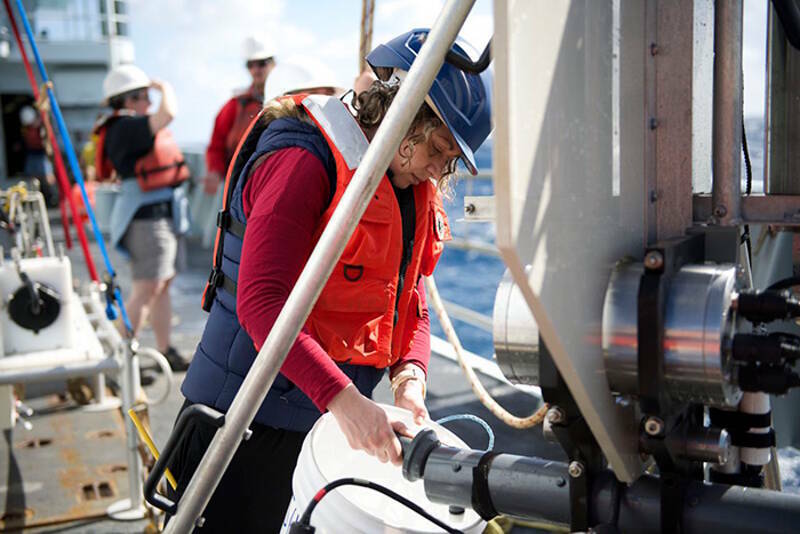 In addition to NSF support, funding for Nereus also came from the Office of Naval Research, the National Oceanic and Atmospheric Administration, the Russell Family Foundation, and WHOI. "We are grateful to our partners for helping build such a breakthrough technological innovation in deep-ocean exploration and to the many engineers, technicians, and scientists at WHOI and around the world who helped realize our vision of a full-ocean-depth research vehicle," said WHOI President and Director Susan Avery. "Nereus may be gone, but the discoveries it enabled and the things it helped us learn will be an indelible part of its legacy." Whitman College undergraduate Gemma Wallace (left) and University of Hawaii graduate student Mackenzie prepare to measure the displacement volume of a holuthirian brought up from 8,000 meters. Image courtesy of Ken Kostel, Woods Hole Oceanographic Institution. Download image (jpg, 63 KB). The depressor is readied for launch ahead of Nereus on a dive to 9,000 meters. Image courtesy of Ken Kostel, Woods Hole Oceanographic Institution. Download image (jpg, 56 KB). R/V Thompson able-bodied seaman signals the crane operator to lower the revised hadal lander into the water. Image courtesy of Ken Kostel, Woods Hole Oceanographic Institution. Download image (jpg, 58 KB).